= STEPHEN'S MOLDAVIA FOREVER ROMANIAN and Stephen the Great and the Holy consecrating a church. inscription "MIHAI·I·REGELE·ROMANILOR" meaning "KING OF THE ROMANIANS", MIHAI I head facing left and year 1941. Under the neck lies Ioana Bassarab, the engraver's name. The beginning of the motto PRIN STATORNICIE LA IZBANDA (found on other two coins, 12.5 lei 1906 and 25 lei 1906, with the form ISBINDA) is marked by a Maltese cross (a cross with arms like arrowheads, pointing inwards). The inscription on the edge can take various positions respective to the faces of the coin. It can start from anywhere and can be read as the obverse or the reverse face up or down. This observation is accurate for all the incuse inscriptions or ornaments on the edge of the Romanian coins from the beginnings up to present (2004). For the inscriptions on the coin faces V instead of U was used. The letter A does not have its horizontal line. Other letters too look quite different: S, C and D. This font was in vogue in the years before the WW2, being used, for example, in several philatelic issues. For the motto on the edge another font was used. This is one of the very few Romanian coins with the matching side direction: top obverse - top reverse (like medals). 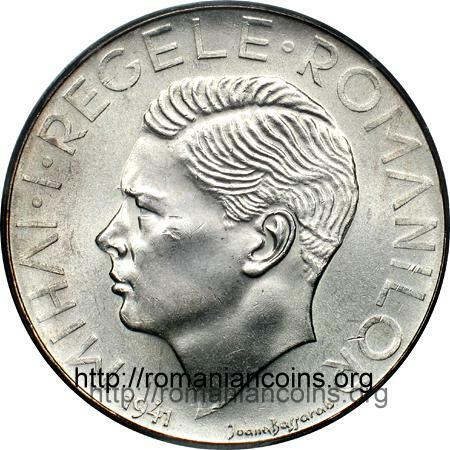 On the large majority the Romanian coins the sides are placed top obverse - bottom reverse. The main element of the coin design pictures the Moldavian voivod Stephen the Great and the Holy, knelt, consecrating a church. It seems to be inspired from a picture inside the evangel (or gospel) from 1473, ordered by Stephen the Great for the Humor monastery and manufactured by hieromonach Nicodim (ordained priest, hieromonachoi in Greek). The mantle worn by the voivod is very loose, with many folds, without sleeves and with a narrow hem. The voivod has whiskers and long hair, as he was represented in the pictures in his epoch, on epitrachelions or on votive paintings (images with miniature of the monuments, held by the founders that offer them to patron saints - the name comes from the Latin votum, meaning promise or vow). The epitrachelion is a stole, a long scarf-like cloth, decorated with religious motifs, worn by the Orthodox priests and by the high hierarchs when officiating the religious service. 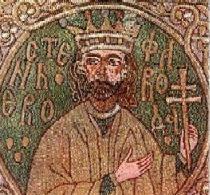 On such an epitrachelion, preserved at Putna monastery, the voivod Stephen the Great and the Holy is depicted (see image at left). 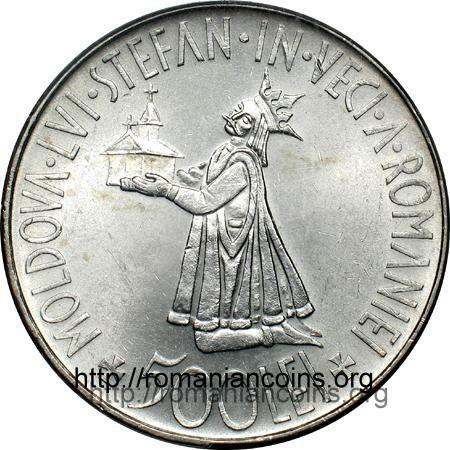 The opinion exists that on the coin is represented the very church of the Putna monastery and is widely spread. The resemblance with the actual aspect of the church is quite weak. Another very old painting of Stephen the Great is presented at left - the lower picture. 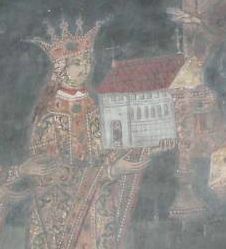 This is a fragment from the votive painting of Dobrovăţ Monastery near Iaşi. The stone church of Dobrovăţ was founded by Stephen the Great in 1503, being finished by Bogdan III, son of Stephen. The church was painted in 1529, in the first reign of Petru Rareş, another son of Stephen the Great. The great Moldavian voivod is also present on other Romanian coins: 20 lei 1991, 5000 lei 2004 - Stephen the Great's Death Quincentenary, 1 leu, 5 and 100 lei 2007 - 550 years since the enthronement of Stephen the Great in Moldavia and 10 lei 2008 - Voroneţ Monastery. This coin is a metal record of the liberation of the eastern Moldavia, between the rivers Prut and Nistru (Dniester or Dnestr), from the Soviet Union occupation. The big cities Cernăuţi (today Chernovtsy, in Ukraine) and Chişinău (the Russian name is Kishinyov) were liberated on July 5th and respectively on July 16th 1941. On July 26th the city of Cetatea Albă (named Belgorod-Dnestrovsky by the Russians, Akkerman by the Turks, both meaning White Castle, the same as in Romanian) was taken back and thus the defeated Soviet troops were chased over the borders of the Homeland. Basarabia (Bessarabia) and Northern Bucovina (Bukovina) had fallen to Russian hands after the ultimatum received by Romania on June 26th 1940.